You will also need a metal cake ring measuring 15–17cm diameter. Place the butter and icing sugar in the bowl of a mixer with apaddle attachment or use an electric whisk. Cream the butter and sugar together for a couple of minutes until light and creamy. Add the chopped hazelnuts and mix for a minute. Turn the mixer to the lowest speed and add the flour. Mix for a couple of minutes or until fully incorporated then add the egg, salt and orange zest and continue mixing until it forms a very soft dough. Place the dough on a piece of clingfilm and gently mould it intoa flat square. Wrap the square in the clingfilm and place it in the fridge for a minimum of 1 hour to rest. Preheat the oven to 170C, gas mark 3. Roll the dough between 2 pieces of parchment paper until it is approximately 0.5cm thick. Place in the freezer for 20 minutes. Place the chilled dough on a baking tray, remove the top layerof paper and bake for 20 minutes or until golden brown. Remove from the oven and immediately cut a disc out of thedough using the inverted cake ring as a large pastry cutter.Leave the metal ring in place and allow to cool completely. Add the cream and salt to a small saucepan and place over a medium heat until it almost reaches boiling point. Melt the dark and milk chocolate in a bowl over a saucepan ofsimmering water. Remove the bowl from the heat and stir in the orange zest and cream. Mix thoroughly until fully incorporated, and stand for 10 minutes then pass through a sieve and leave to cool to room temperature. Once the tart base is cool, using a pastry brush, spread someof the ganache on top of the base and around the edges. Placein the freezer for 5 minutes. This will ensure that the ganachewon’t seep through. After 5 minutes, pour the remaining ganache into the ring andplace the tart in the fridge to set for at least 4 hours. To demould, hold a sharp knife under a hot tap and then run itaround the inside of the ring. Carefully remove the ring and place the tart on a serving dish ready for decoration. 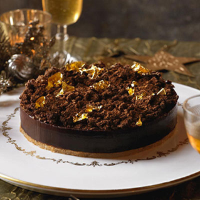 For instuctions on how to decorate see To decorate Heston's Spiced popping candy chocolate tart. Be sure to store your popping candy in an airtight container so it doesn’t absorb any moisture and start popping too early. Any leftover base can be drizzled with sieved melted chocolate from the decoration to make indulgent but perhaps irregular-shaped biscuits! This recipe was first published in December 2010.